Today at Middleton, South Carolina [below] you can still see the 18th century lawn that extends down to the water’s edge. American colonists adopted the for mal English landscape design for both the wealthy,educated homeowner as well the commoner. So, at Colonial Williamsburg today, for example, you can see the beautiful formal gardens in the landscape of the Governor’s Palace. The formal style is what the English of the 17th century had developed after seeing the landscapes of the French, Dutch, and the Italians. In the 18th century the English moved to a more natural or picturesque view, with a lawn, carefully placed trees, groups of shrubs, informal walkways, and sometimes a lake or pond. According to architectural historian James D. Kornwolf, American colonial and federal gardens are usually regarded as symmetrically formal, characterized by terraces, parterres and allees of poplar or box. But that he says was not the case entirely. 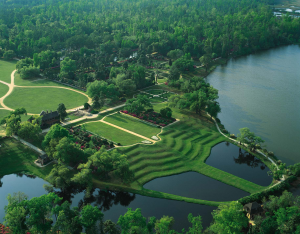 One exception to the formal English look in early American landscape design was Middleton, South Carolina which displayed a picturesque landscape, with its large green turf. carefully planted down to the water. Middleton became an early example of the importance of the lawn, and the new English style of garden. You can still visit Middleton today. Kownwolf says that Middleton’s gardens and those at Drayton Hall form the earliest known picturesque gardens in America, both probably dating from around 1740.